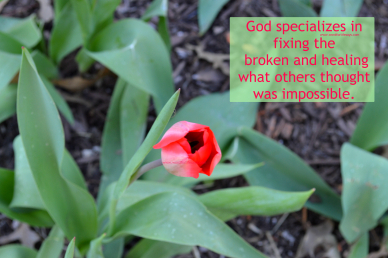 God specializes in fixing the broken and healing what others thought was impossible. Trust Him with everything that is bothering you and let Him work it out. I don’t know about you but have failed at so many things in life. If I would begin to go down the list and check off all the goof-ups, blunders, and short-comings it would tell a story most don’t get to see on the outside. In every area of life, be it marriage, raising children, my relationship with God, or whatever – there is a mark of imperfection there, a blemish on my record. Failure is one of those things that are hard to overcome for some. Mess-ups have a way of smearing defeat in one’s face making them feel that there will never be a space for recovery and restoration.